When it comes to what actually delivers improvements in the lives of poor children in developing countries – and what doesn’t – the people who know best tend to live in developing countries. They live with the problem and their lives are directly affected by their success – or failure – in developing the solutions. South-South cooperation is the process of sharing knowledge between governments and people in developing countries. Last week, I attended a high-level meeting on South-South cooperation in Delhi, India. Senior government officials from across Asia and the Pacific gathered in ‘Incredible India’ to share what they know. The early years of life are crucial for lifelong health as well as for physical, cognitive and emotional development. So early childhood development was one of the issues they discussed. The second focus area was adolescence. We all know that adolescence is a testing time, no matter where you live. But nine out of ten adolescents currently in our world live in countries where they face especially profound challenges – from obtaining an education to simply staying alive – challenges that are often magnified for girls and young women. The global migration to large cities and smaller towns from rural areas has reduced poverty, but urban clusters are fast becoming home to the world’s largest slums, with Asia home to 61 percent of the world’s 828 million slum dwellers. This has a big impact on children in need and how we help them. The third focus area was children and urban issues. What struck me most about the event was the eagerness of government representative – from Afghanistan to Niue – to address these issues. They all know there are problems, and they all know they need to share solutions. And they are working to do this. The outcome of the meeting was pretty amazing. 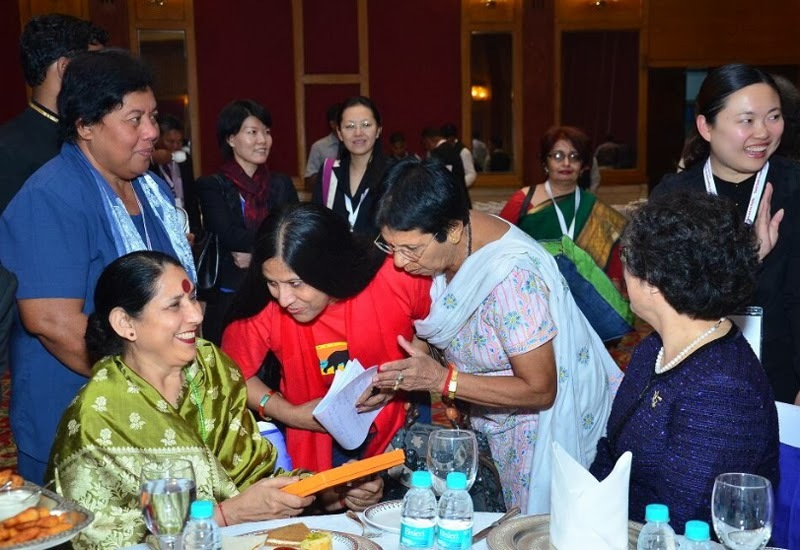 The delegations signed up for a Delhi Declaration – a promise to work together to help each other help children. At the start of the Declaration is an important affirmation of children’s rights. These rights exist and every Government in our region knows it: the Convention on the Rights of the Child is one of the most widely accepted international treaties ever created. But like everything that is not contentious, these rights sometimes gets forgotten and they are violated far too often. So to have 32 countries “renew their vow” to support every child in the region was important. They also recognized that investments in children are investments in our collective future. They acknowledged that, although the rights exist, far too many children’s rights (to health, education and protection from violence, to name just a few) are not protected or met. Children are being left behind, and some are even worse off today than they were been before Asian economies started their phenomenal growth. There are plenty of reasons to focus on the issue of adolescence. Increasing the schooling of a nation’s labour force by just one year has been shown to raise output by 3 to 6 per cent. When we invest in girls’ education, we don’t just give them knowledge and skills. It leads to prosperity and inclusion. Adolescents hold the key to building just societies where all people have equal rights and possibilities. The countries agreed to seek adequate investments, including in the areas of education, job creation and social participation to address the different threats and challenges faced at each stage of adolescents. They also promised to work for meaningful participation by adolescents on matters that affect them, and to encourage civic education, youth participation, and leadership. The second issue discussed was early childhood development (ECD). Addressing this issue is a human and moral obligation for the leaders of Asia and Pacific. By UNICEF’s estimate, we can prevent stunting in the first 1,000 days of a child’s life for less than US $20 per child. Nearly 10 percent of all under-five deaths in the Asia Pacific region are caused by diarrhoea, which is easily preventable. The governments promised to work to enhance a range of ECD initiatives, including exclusive breastfeeding, full immunization, access to clean water, hygienic sanitation, and quality early learning and stimulation, with a particular focus on reducing disparities. The third and final issue was urbanisation. Over 40 percent of people in Asia Pacific live in cities, and the rate of urbanization is among the highest in the world. Some urban children have good prospects. For too many others, urbanisation means severe inequalities and exclusion. City dwellers living in slums face strong demands for housing, education, health care, water and sanitation, and food security. Among the issues the Declaration addresses is the need to increase investments in child rights in small and medium sized cities – those with less than 100,000 inhabitants – because these cities will see the bulk of population growth in our region. The governments will try to improve their knowledge about what’s needed and what happens, particularly in city slums, so that policies and programmes will be more effective. They will look at encouraging cooperation and experience sharing between mayors and local authorities. And they will also examine what can be done to provide children and their families in rural areas with support and services, to ensure they are not forced into cities. 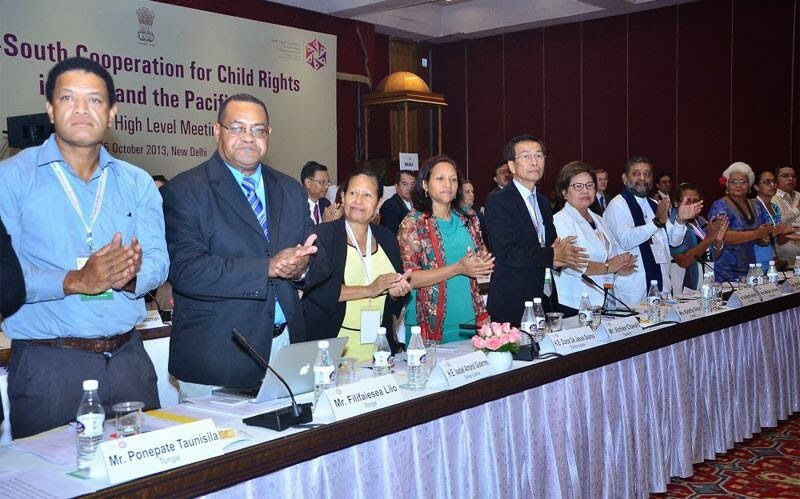 For me, this ‘New Delhi Declaration on South-South Cooperation for Child Rights in Asia and the Pacific’ is important because it gives new energy to some really important issues, and it means that people who deal with these issues on a daily basis will share what they learn about how to address these issues. If we work together and make sure the Declaration’s recommendations become a reality, then everyone’s lives will be better. That’s the next challenge: to deliver on these noble aspirations. Because they will give power to kids and young people – who already want to make positive changes – so that they can make the world a better place for everyone. Her voice, her call for attention, her aspirations are shared by millions of adolescents and children who live in big urban centres across Asia and the Pacific.